A Blogger blog can have multiple RSS feeds for similar content. Many Feed subscribers could be accessing RSS feed for a specific label or post in your Blogger Blog. It is very important to have only one single consolidated feed. This is required to get the exact number of total feed subscribers of your blog. With redirection system in place every feed reader will be redirected to only one unique RSS feed of your Blogger blog. Also, you can monetize Blogger blog effectively by using Google Ads for FeedsÂ and earn more money. 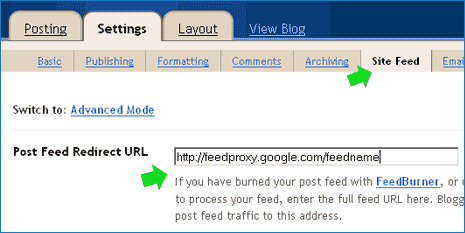 HOW TO SETUP RSS FEED REDIRECT IN BLOGGER? It is very easy and can be implemented using in-built feature located in Blogger dashboard. Login into your blogger account, goto settings, click on ‘Site Feed’ tab’. Then enter RSS feed URL in text box with label ‘Post Feed Redirect URL’. This feature works with both dot blogspot and custom domain blogger blogs. Setup this redirect on your Blogger blog to know exact number of subscribersÂ and to monetize blog effectively. On the same settings screen you will also find ‘Post Feed Footer’ option. You can enter any text, links or even 3rd party ads that can be displayed in your Blogger blog RSS Feed! What RSS Feed company do you use or where do you get it for the feed URL which one do you use?